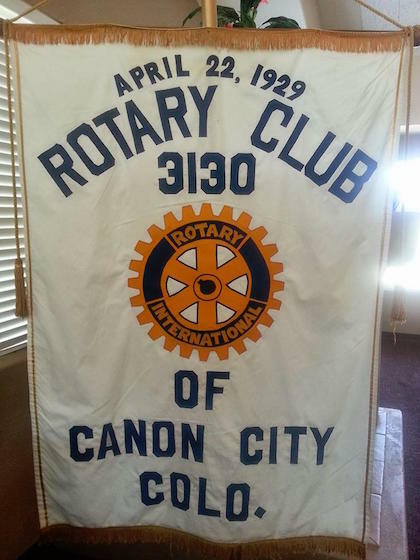 The Rotary Club of Cañon City is part of Rotary International, a worldwide service organization that promotes peace through understanding. As a fellowship of business and community leaders, we have fun while helping locally and internationally. If you want to have a positive impact on Cañon City and the world, what better place to do that than with a group of like-minded individuals. Come and find out more about Rotary and our Rotary Club. FIRST -- The development of acquaintances as an opportunity for service. SECOND -- High ethical standards in business and professions; the recognition of the worthiness of all useful occupations; and the dignifying by each Rotarian of his occupation as an opportunity to serve society. THIRD -- The application of the ideal of service by every Rotarian to his personal, business and communty life. FOURTH -- The advancement of international understanding, goodwill, and peace through a world fellowship of business and professional persons united in the ideal of service.